Aside from providing a beautiful sample of Florida's famed sand and sea, Crandon Park Beach also has an Amusement Center with a carousel, a roller rink, a splash fountain, and a playground for kids to enjoy, making it a very good option for families on holiday. 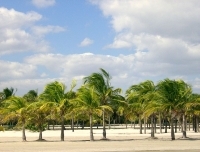 The Crandon Park Gardens are a haven for indigneous plants and animals, with a few picnic spots to enjoy as well. The beach itself is long and spacious, ensuring that it seldom feels crowded, and there are plenty of picturesque palm trees providing shade. The water deepens very gradually so that the shallows are extensive and safe for kids.